Posted By:Unknown | At:11:10 AM Be the first to comment! ORANGEBURG, S.C. (AP) -- Talk show host and media mogul Oprah Winfrey has conducted a jailhouse interview with a South Carolina mother who pleaded guilty to killing her two sons. Winfrey went to the jail in Orangeburg last week where 30-year-old Shaquan Duley is awaiting sentencing. Winfrey interviewed Duley's family in September 2010, a month after Duley suffocated her 2-year-old and 18-month-old sons, then tried to stage their deaths by driving her car into a river. 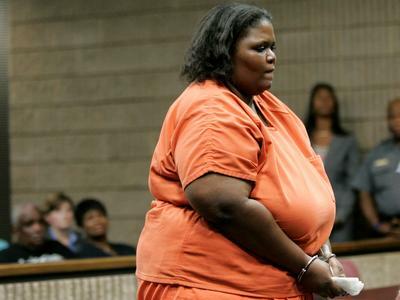 Prosecutors say she killed the children after being badgered by her mother about being a poor parent. Duley faces 30 years to life in prison when she's sentenced Friday. The interview will air at 9 p.m. on April 1 as part of "Oprah's Next Chapter" on the Oprah Winfrey Network. Oprah has also expressed interest in interviewing Trayvon Martin's parents as will as George Zimmerman. She made it know through her Twitter account. @BasseyworldLive anyone who's lost a loved one knows their pain. I'd interview them too, but want the eyewitnesses & Zimmerman .